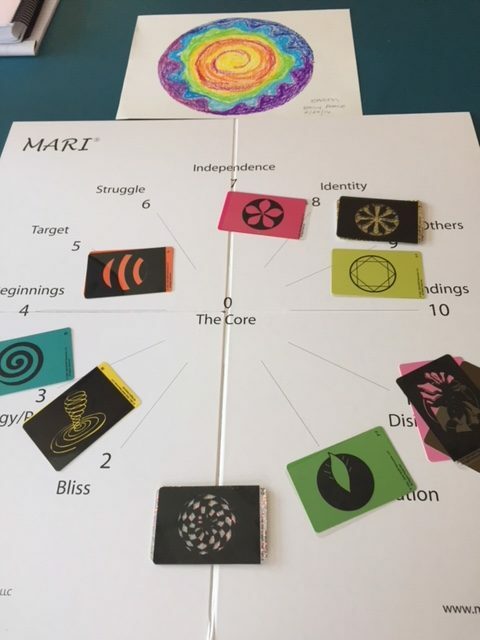 Based on the work of Swedish psychologist Carl Jung, the MARI® (Mandala Assessment Research Instrument) is a comprehensive and holistic psychological assessment. It engages both the left and right hemispheres of the brain and uses all four aspects of consciousness; thinking, feeling, intuiting and sensing to identify relevant psychological information and issues around meaning and spirituality. Using color, symbol, and the developmental cycles of life, the MARI synthesizes these aspects and offers the psyche an opportunity to “see itself”. Participants are asked to choose symbol and color cards that resonate with them at the time. The cards are then placed around “The Great Round” in their predetermined place on this wheel of life to reflect back to the viewer a snapshot of current developmental focus both in their conscious lives and/or the unseen other than conscious world. Like in a photograph, there is the apparent first image that is perceived by the viewer, but with steady attention a deeper sense of meaning emerges in deep background. Likewise, the MARI participant is processing on multiple levels as s/he hears explanation of the placement on the board, experiences the activation of the visual cortex and sees the psychic content of their current life or state of being. Mandala is a Sanskrit term meaning “circle” and has been used in various cultures as a guide for meditation. The mandala represents wholeness and connects us to the world beyond and within our bodies and minds and integrates the material and non-material. The MARI experience begins with the opportunity to create a mandala with a selection of colorful pastels. No artistic background is needed for this process that is simply intuitive expression. This self generated mandala is explored with the themes generated by the card and color selections placed on the Great Round. The potential for resolution or healing of any discordant aspects of the psyche is available in the process of the assessment itself. The door is also open for further exploration and transformation via other healing modalities such as hypnotherapy, somato-emotional release, Reiki, or counseling. Like other holistic approaches to health and healing, the MARI is strength-based and views individuals as potentially whole. Working within the field of symbol, the participant can by-pass their protective ego and move to the truth of Self, which can prove to be an enjoyable and transformative experience!